“The truth is like a lion; you don’t have to defend it. Let it loose; it will defend itself,” Augustine of Hippo. Leadership is about vision! It’s also equally about creating and fostering a climate of truth, where you and your team can hear the good and the bad. For one to lead, you must instill a culture where people can speak their minds – filtered for respect – but where the truth comes out! Anyone can host a meeting where they dictate to a small group. They may even ask if anyone has questions, but don’t be fooled; the meeting is about a select few people talking at you. Meetings have their time and place but if you seek the truth, then host a forum, not a meeting. The big difference between a meeting and a forum is how you approach it. In a forum setting, there is no right or wrong, just the pursuit of getting closer to the truth. During our forums, we pose, ponder and answer some profound business questions that wouldn’t otherwise be developed at a meeting. Within our culture debate is welcomed and never shunned! A good debate engages team members to ask questions and share their insights with one another. Having a space where people can share their thoughts has been essential to our way of life. I can recall one debate regarding lead times. We posed the question “What in your opinion is an adequate lead-time for product X?” The debate sparked much passion, which in-turn, resulted in our best lead times ever! We set up these opportunities to ensure that goals and objectives are being met; consequently, if they are, how can we strive for even greater? If the results aren’t favorable, we simply reevaluate our strategy or game plan while avoiding placing blame on an individual. When you play the blame game, fear is present, nobody wins and the truth rarely shows up. If the truth doesn’t come out, it will be difficult to improve and achieve your potential, plus you don’t receive the opportunity to learn from your trials. Establishing a timeframe with proper Key Performance Indicators avoids waiting until it’s too late! Before you begin an initiative, outline when, where and how you’ll reconvene. When everyone is on the same page and aware of the scope and importance of your project, they’ll be more likely to speak the truth throughout the process. Their ability to ask for assistance early on will have others on the team jumping to help versus waiting until it’s too late and engaging in a blame game. Leaders must do everything in their power to build an environment that fosters trust and eliminates fear or suffer disappointing results. Our Family Core Value #9 is to “Deliver transparent, open and honest communication” which will only occur when everyone feels free to share the truth! What are your secrets to finding out the truth? Ain’t that the truth ruth! Love this topic and a great quote! 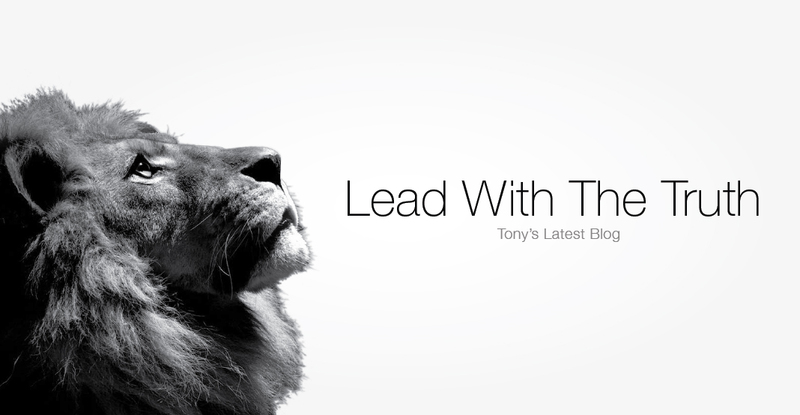 Love the blog Tony! Great accomplishments begin with open and honest communication and the contributions of an entire Team. Dedication, Commitment and Responsibility are some of the results. Tony, great blog! I love your passion and approach as a LEADER! I take away from this blog a tremendous amount of pride and appreciation as being a member of this amazing TEAM!! Short and Simple Key Concepts and Insight for leaders across the board! Love the Roma forums vs. meetings!! It’s amazing how simple little steps to leadership can bring results so much more than the laborious steps to management! So glad to be a part of the team Tony…keep the information flowing! Love the small tips that make a company’s culture rich and lasting! “#2 Debate, Have Fun And Then Debate Again.” has got to be my favourite! Thanks for the great post! Looking forward to what’s to come. Thank you Melissa and Caliman! Leading with the Truth is above all, the most important element for success and happiness!!! – Thank you both for your comments!